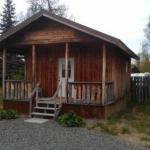 Offering a garden All Seasons Campground offers accommodation in Ninilchik Alaska. Free WiFi access is available here. Homer is 62 km away. The lodgings here consist of one or two-bedroom cottages. A kitchenette with an oven and microwave as well as a private bathroom with a bath or shower is provided in each unit. Homer Airport is 66 km from the property.